Chicken may be ubiquitous on the American dining room table, but in the Tsoi household, it was a roast Peking duck my mother picked up every week during her Saturday sojourns in to Chinatown. It would be hacked up in to pieces, served along with white rice and the other vegetables at dinner. It wasn’t until I was 16 and in Beijing that I had the full traditional Peking duck meal, with the pancakes and all the accompaniments. 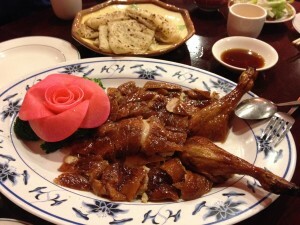 China King will do a complete traditional 3 course Peking duck meal, with 24 hours notice. It’s $39 and will serve 3-4 people. I went with Leslie, Charles and Sumita. The small restaurant was only half full on a Friday evening, with most tables ordering the duck. 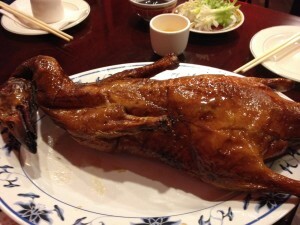 Before the meal starts, they bring the whole duck out, so that we could marvel at the crispy bronzed exterior. The duck is whisked away and returned to us in parts over the course of dinner. First, a platter of duck skin is presented with thin homemade pancakes, scallions and hoisin sauce. I spread a thin layer of hoisin on the pancake, top it with a few pieces of duck and fold it in to a neat package. It was awesomely delicious: the pancake was tender, the duck skin shatteringly crispy, and the sweetness from the hoisin sauce balanced the savoriness of the meat. Admittedly, it was a little greasy, but that was part of the goodness. The second course is a stir fry with the duck meat, but I had read suggestions to get the homemade noodles (additional charge of $6) with the stir fry. 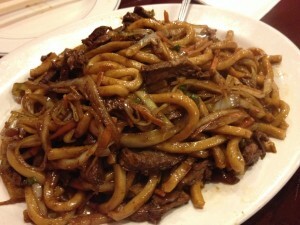 The noodles were thick and toothsome, somewhat similar to an udon noodle. It was hearty and satisfying. Lastly, the carcass of the duck is hacked in to smaller pieces and made in to a soup with mung bean thread noodles and tofu. 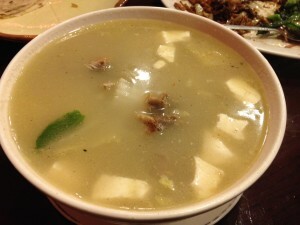 At first, I was not impressed, the soup did not seem to have much duck flavor and the carcass pieces were bony and awkward. But, I finished my first bowl and had a second, and by the time I reached for my third serving I realized that the hot soup felt cleansing, almost like it was rinsing the grease from my system. To supplement our meal, we got scallion pancakes ($4) and an order of sautéed Chinese broccoli ($9). The scallion pancakes were crispy, but also very greasy. The broccoli made us feel better about eating all the grease, as we had something green to go with it. The service was prompt and friendly. The whole meal was a bargain ($72 total). I would definitely recommend getting a couple of friends together for a delicious evening of duck. There’s no website, but here’s the info as well as a link to the Phoenix’s review of the restaurant in May 2012.